Now you can easily prepare your favorite Mexican meals in minutes…all with deep, rich, home style flavor. Make tacos, enchiladas, chili, burritos, chicken mole, huevos rancheros and more! Freshly chopped peppers, onions, garlic & cilantro brighten the flavor of Larry’s All Natural salsa & sauces. Authentic Mexican spices and ingredients such as cumin, cilantro and chipotle enhance the flavors of these delicious cooking sauces and salsa. 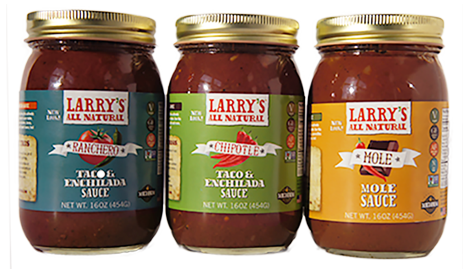 Buy Larry’s Salsa and Mexican Sauces on-line and at grocery stores nationwide. The products are also available for food service.